SHARK Helmets has launched two special-edition graphic schemes on its Spartan model, inspired by the distinctive Race-R Pro design worn by three-time MotoGP World Champion Jorge Lorenzo at the 2017 Austrian GP. The Spartan Austrian GP MAT helmets feature an aggressive devil-inspired design – one in matt black/red and one in matt black/grey – and will be available in UK dealers from this month. The SHARK Helmets Spartan was developed using the latest reverse engineering and Computational Fluid Dynamics (CFD) technology. Everything about its striking design is aimed at achieving optimal aerodynamics and rider comfort, making it the perfect choice as an all-round road-riding helmet. The compact and lightweight Spartan has a number of features developed to make the helmet quiet and stable at speed. A ‘SHARK SKIN’ cover on the side mechanism of the visor contributes to the reduction of whistling noise and a double spoiler on the rear incorporates air extractors for increased internal cooling and aerodynamic trail. A Pinlock Max Vision®insert is included in the box and there’s a retractable integrated sun visor, offering full coverage. 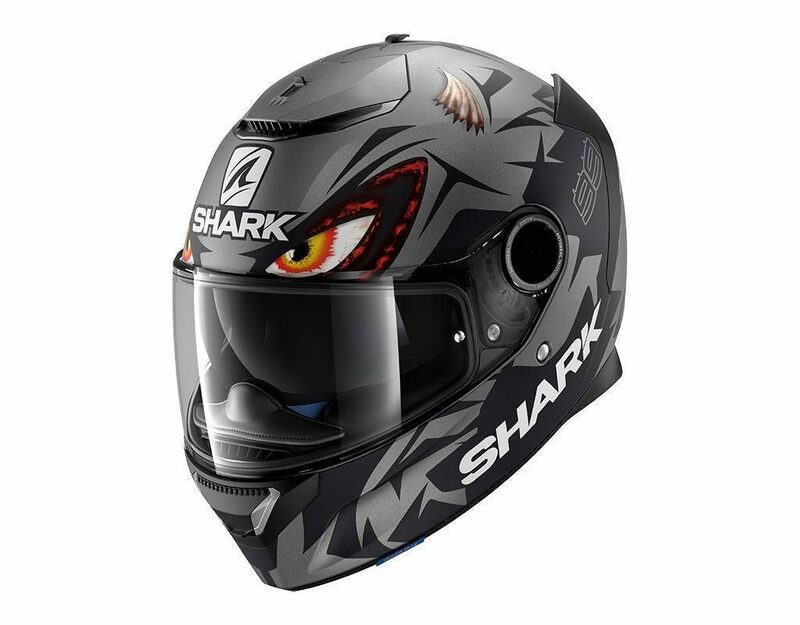 It comes with all the features you’d expect from a premium SHARK helmet: SHARKTOOTH® compatibility, quick release visor system, removable and washable lining, SHARK Easy Fit for glasses wearers, anti-scratch visor and it fastens using a double-D strap system.